FREE Women’s Self Defense Workshop! With a few violent crimes or missing persons cases in the north end of the Seattle area we’ve been contacted by several community members and organizations about our self defense training or workshops. We will be offering this FREE women’s self defense workshop for the community. MKG Martial Arts would like to help the women in our community by empowering them with the tools needed to stay safe. Join us for this very important FREE seminar to give yourself the skills necessary to protect yourself and your family. MKG Seattle’s Women’s Self Defense Program strives to develop the ability for women and girls to gain the knowledge and skills necessary to A) Keep themselves out of harm’s way B) Defend themselves during a violent encounter. 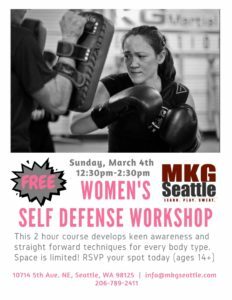 This seminar is taught by certified women’s self defense instructors Bryce Tillett, Ryan Teal and the self defense instructors team at MKG Seattle. Absolutely no strings attached and no prior experience is necessary. Open to women and teens ages 14 and older. Minors must be accompanied by a parent or guardian.